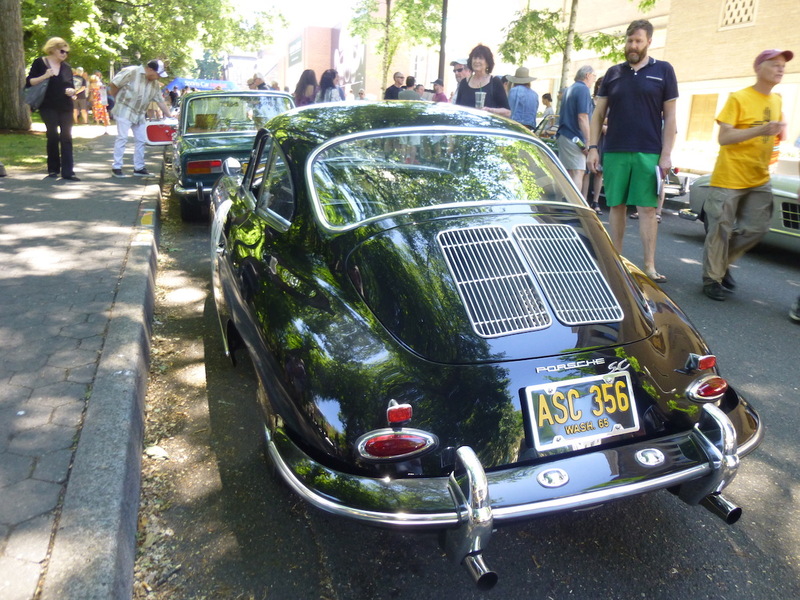 Here are the rest of the cars I saw at “Cars in the Park”, an afternoon’s curbside show of sports cars 1967 and earlier out in front of the Portland Art Museum’s “Shape of Speed” exhibit that Paul N. covered so well in this epic post. We looked at all the Alfa Romeos in Part 1, and at a couple of very special exotics in Part 2. Today’s photos include lots of the spectators enjoying slow looks at some fast-looking and fast-driving cars. 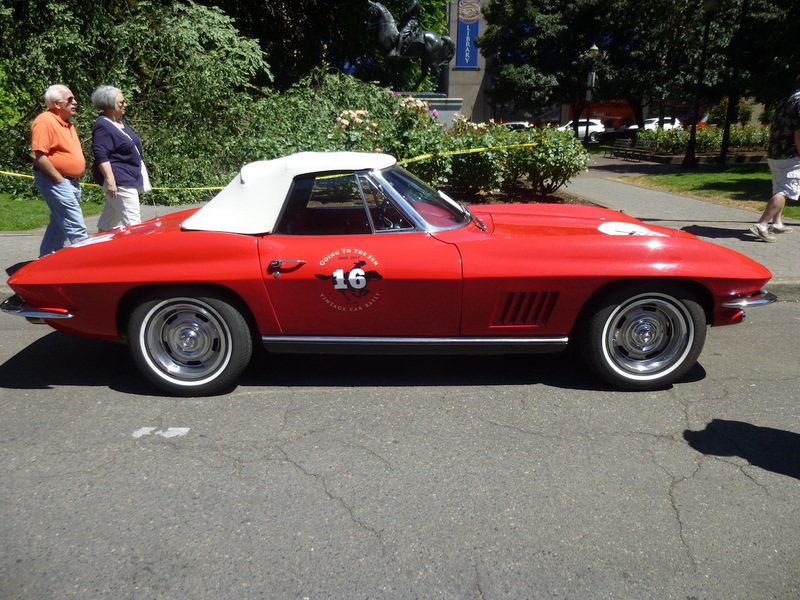 Starting with a sharp 1967 Corvette Sting Ray. 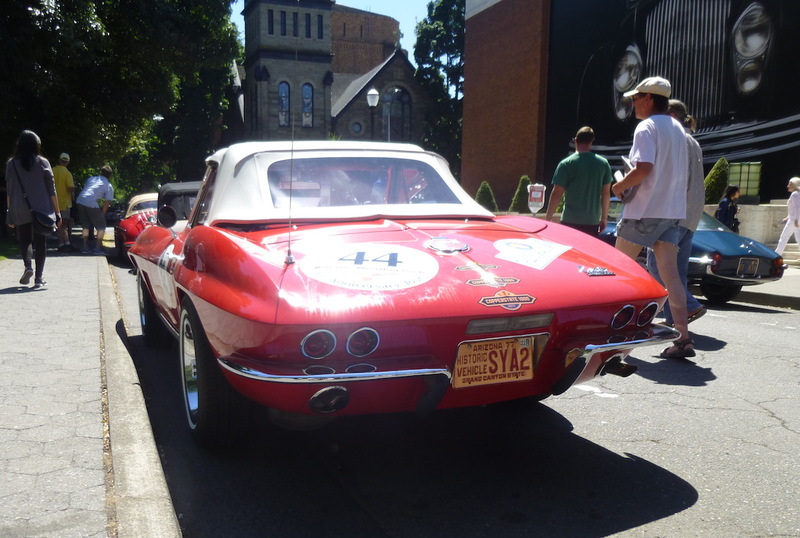 1967 was the last year for the C2 Sting Ray that was such a hit in 1963. 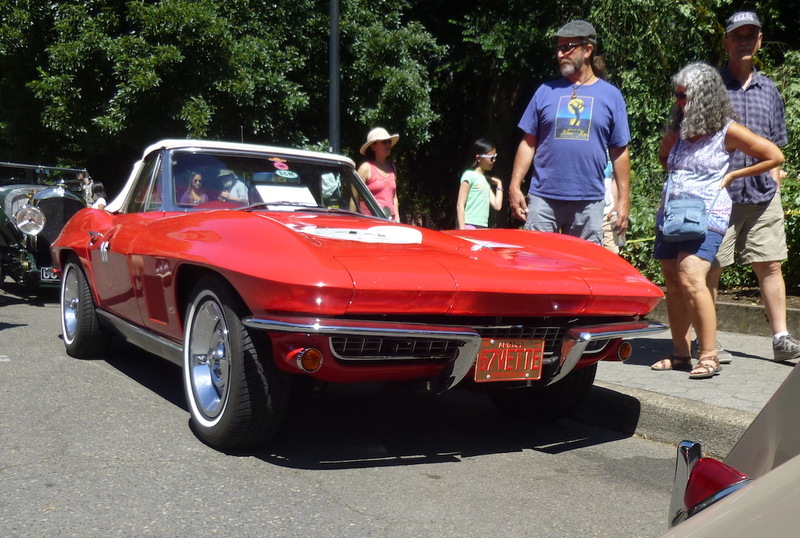 Since everyone knew the next Corvette was just a year away, these ’67s are a little less common. 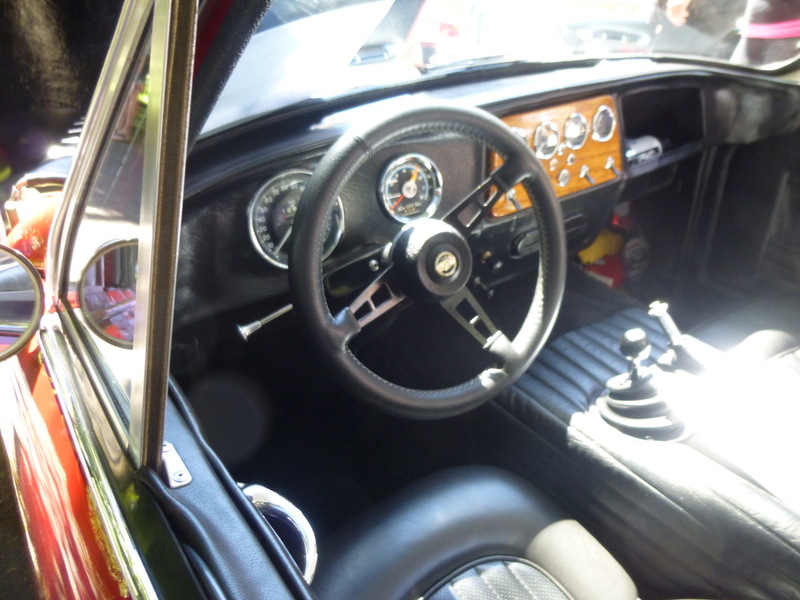 I’ve always especially liked the interior design. Is that an automatic? I can’t quite tell from the picture. Iconic round taillights set off the iconic wraparound edge. Here’s the heart of the 1928 Bentley 4 1/2 Liter. That’s just four cylinders, 1100 cc each. 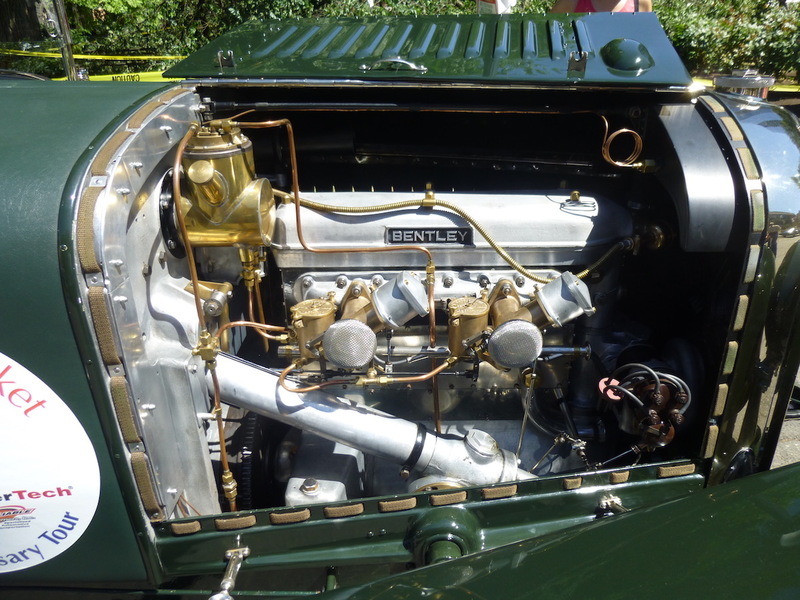 Single overhead camshaft with four valves per cylinder, quite advanced for its time. Twin SU carburetors, dual Bosch ignition. 110 hp, 4000 rpm. Dashing appearance. 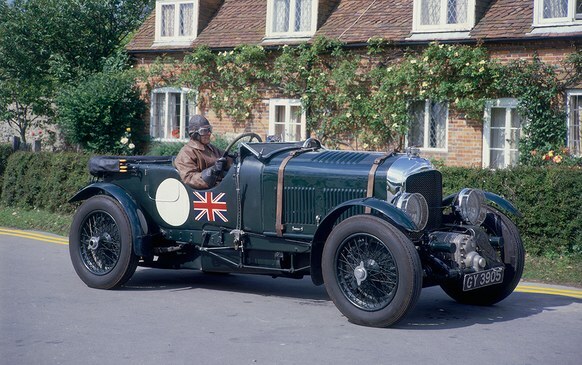 John Steed drove a 4 1/2 Liter Bentley in four episodes of The Avengers. Big drum brakes, finned for cooling. Leaf springs front and rear. Gotta love those huge headlights. Well instrumented. Four-speed transmission, all gears unsynchronized. Racing took some fancy footwork. 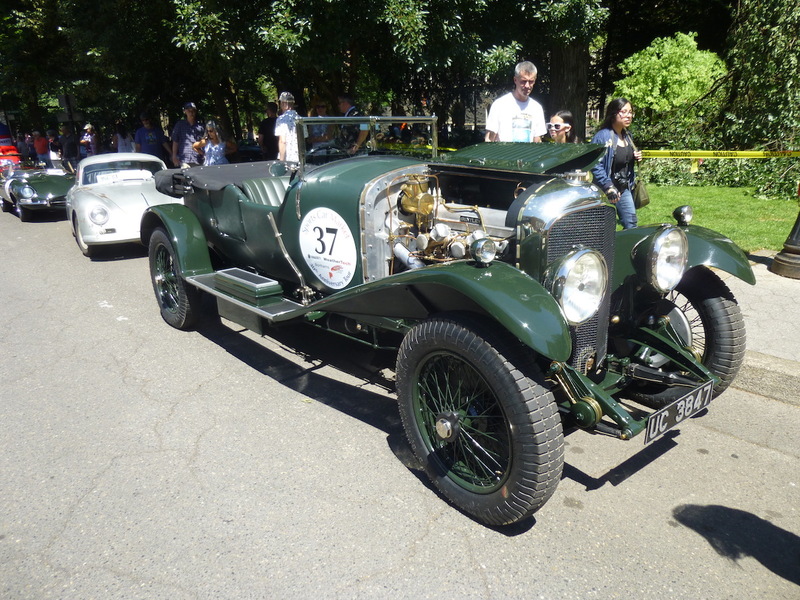 Woolf Barnato and Bernard Rubin won Le Mans in 1928 in a 4 1/2 Liter Bentley, setting a record average speed of 69 mph. 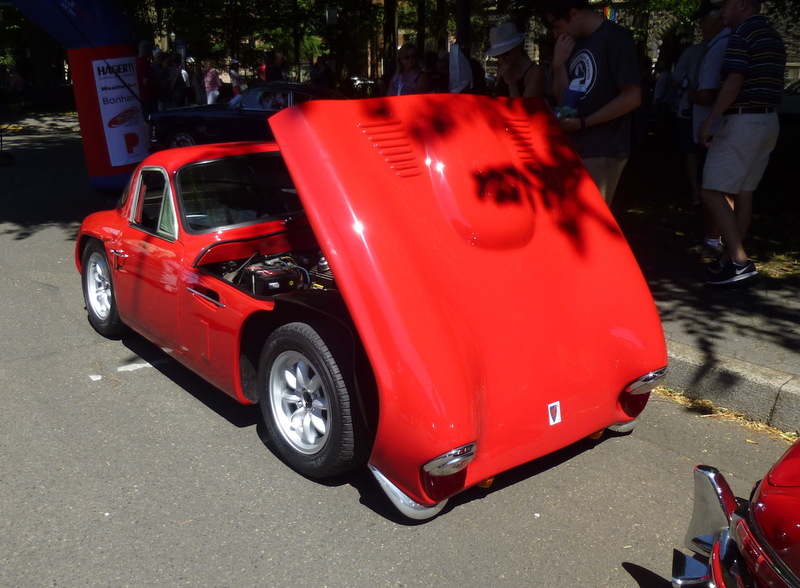 This Anglo-American 1965 Griffith Series 200 is a fiberglass body with a TVR tubular steel chassis wrapped around a 271 hp Ford 289 Hi-Po V8 with dual-quads. 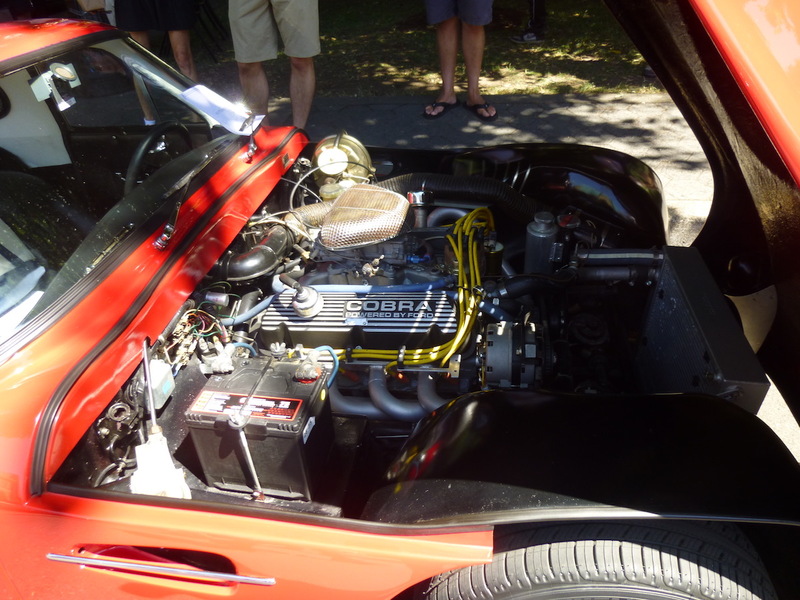 I’m curious about the Cobra valve covers, since this first Griffith was built to beat Cobras. Jack Griffith, an American with a racing shop, had dinner one night with Carroll Shelby. As the evening developed, Jack declared he could build a car faster than the AC Cobra and this car was born. Here’s what it looks like with the hood closed. 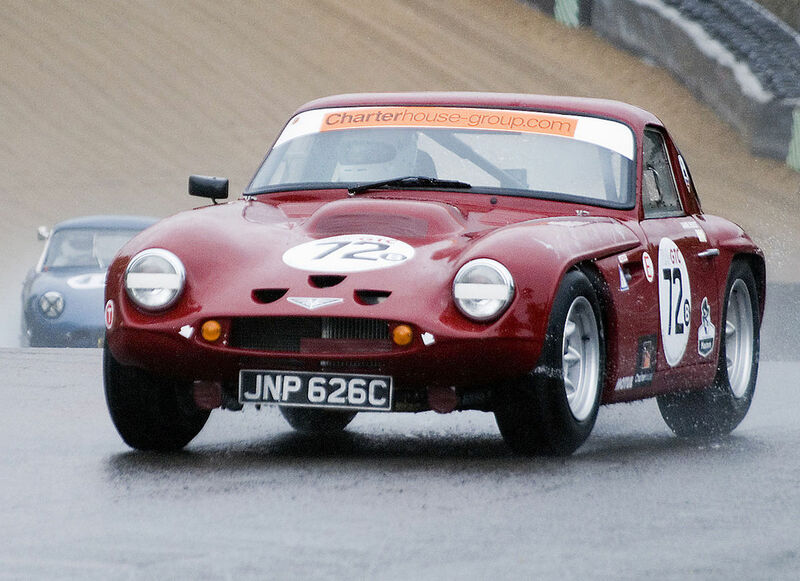 In the US, Jack sold it as the Griffith Series 200, while in the UK it was sold as the TVR Griffith 200. Proper British interior. Big central spine. Pretty much just four wheels, a hot engine and a place to sit. With 0 to 60 in 3.9 seconds and 150 mph top speed, this is the view most would have of a Griffith Series 200. Here’s a pair of Porsches. 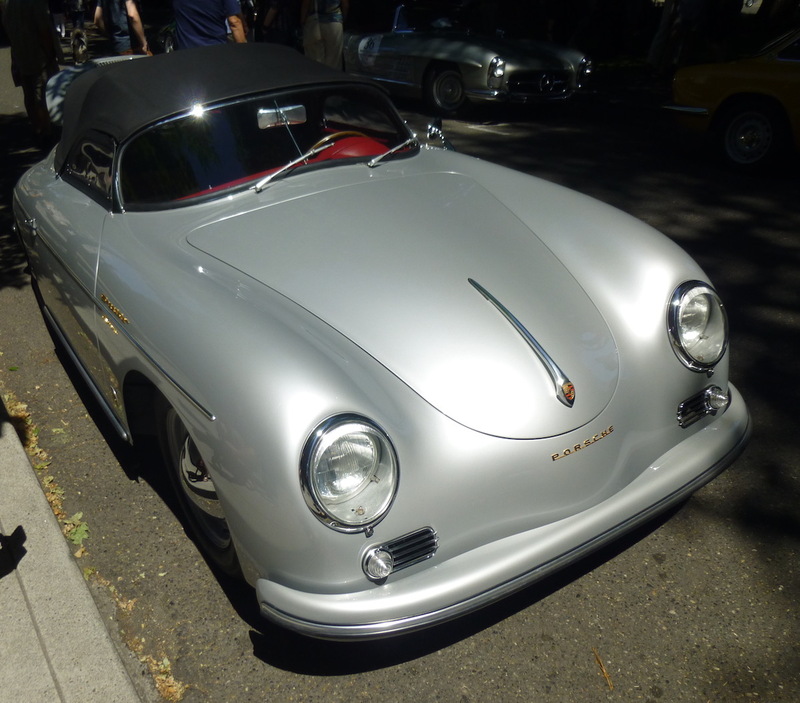 First, an early 356, the 1955 Porsche 356A Speedster. Introduced in 1955, the 356A was in a long series of 356 Porsches going back to the very beginning in 1948. This one appears to have a custom steering wheel. 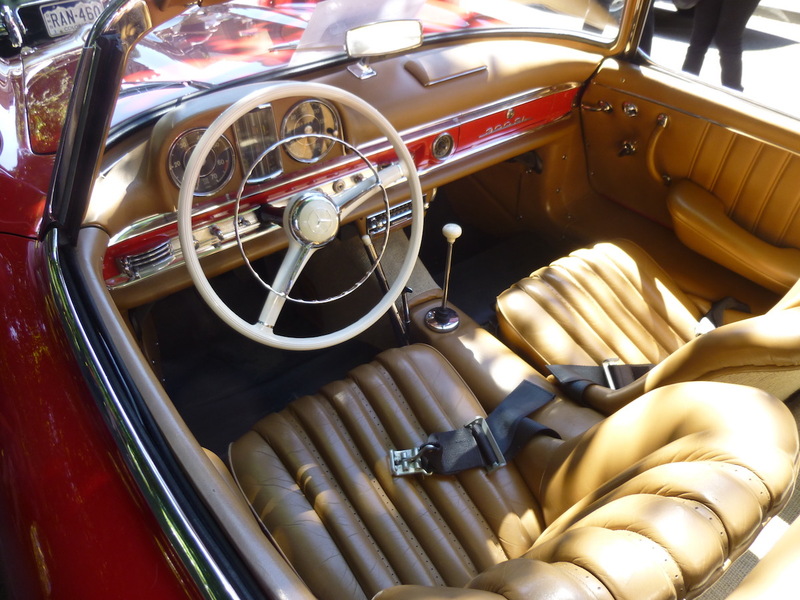 “Speedster” means it’s a convertible, “Carrera” means it has the optional four-cam engine. 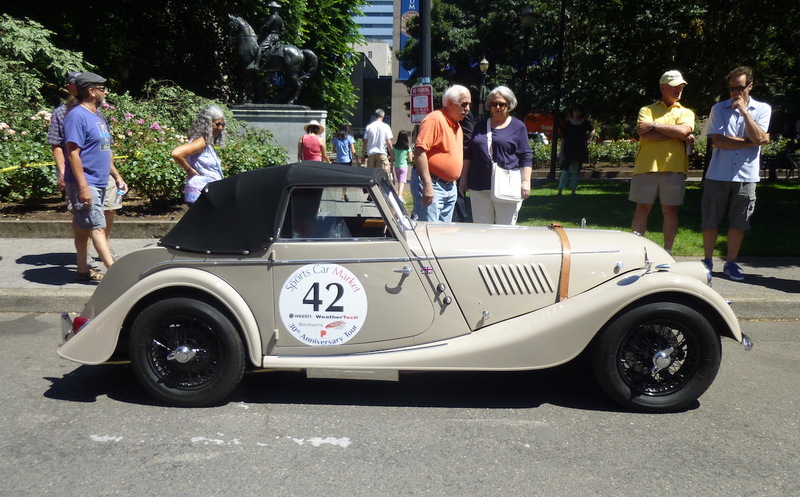 The little badge says “Custom Coachwork by Reutter Stuttgart”, who was known for their exceptional workmanship. A curbside treasure from the “Treasure State”. 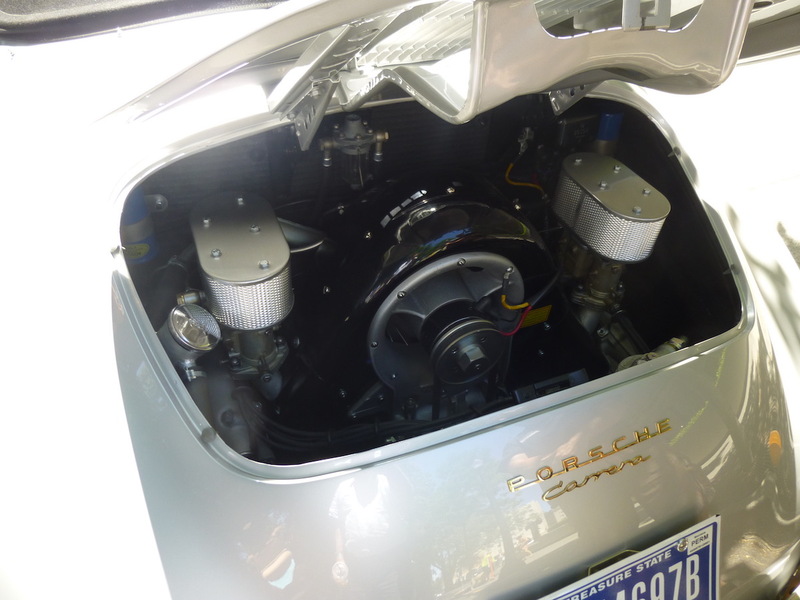 Its 100 hp quad-cam 1500cc Carrera engine breathes through twin Zenith carburetors. An air-cooled boxer 4, you can still make out its VW roots. 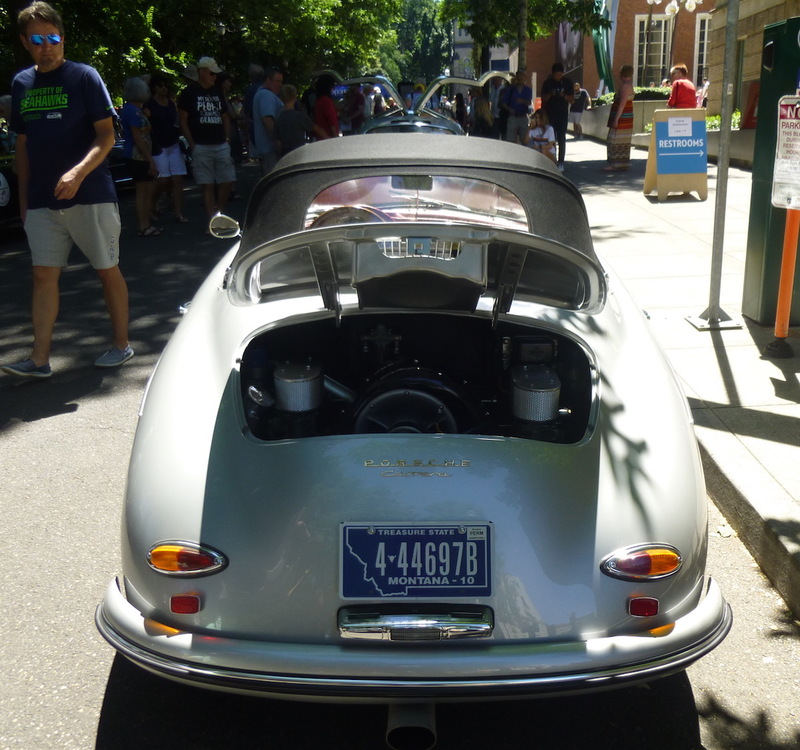 From the end of the 356 series, this 1965 Porsche 356C coupe surprised me. I had thought when the 911 came out in 1964 (in the US) it replaced the 356. 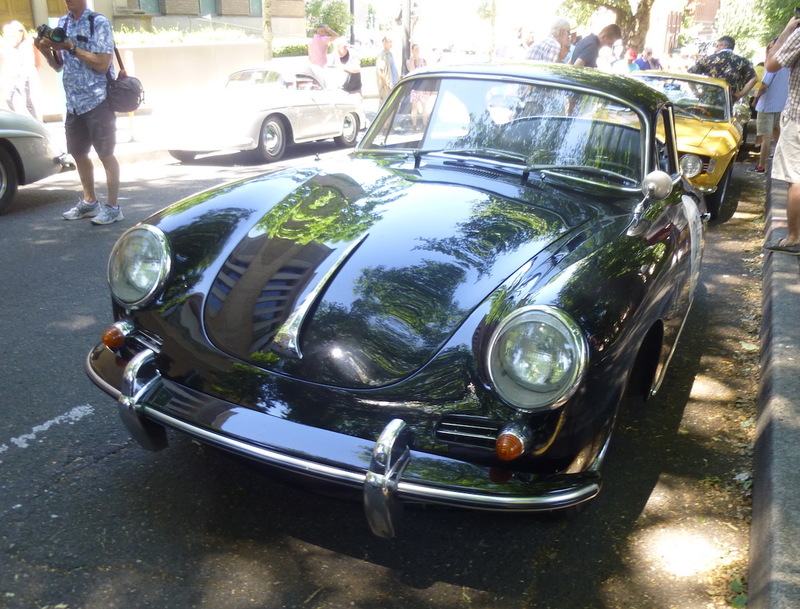 But they were sold side by side for a year or two as some preferred the lighter 356. By this time the engine had grown to 1600 cc, with 95 hp in the SC version. (The Carrera was two liters and 140 hp by then.) 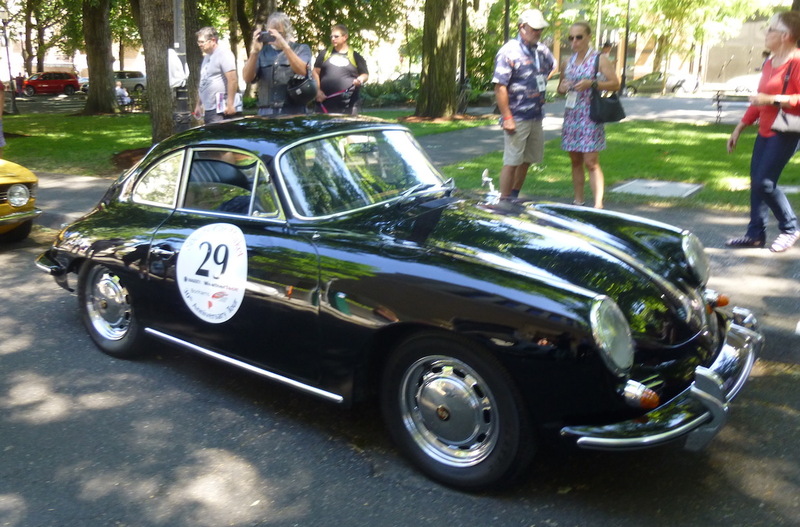 The 356C has disc brakes all around. A businesslike interior. 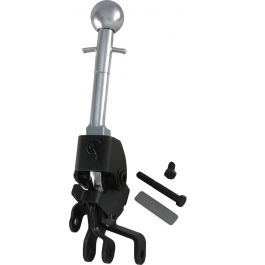 I expect that shifter has much less play than my 1965 Beetle’s did. Neat how those exhausts combine with the bumper overrides. 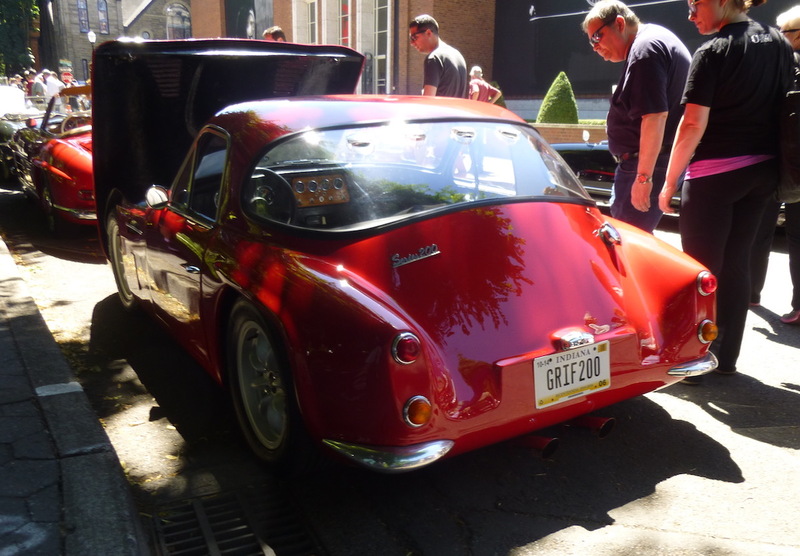 This car was the end of a long and proud 356 tradition, making way for the 911 epoch. From the same year as the 356C, this 1965 Morgan Plus 4 Drophead Coupe is the embodiment of British sports car tradition. Even in ’65 it still used a leather strap to hold its side-opening bonnet shut. That’s one huge and vertical steering wheel. 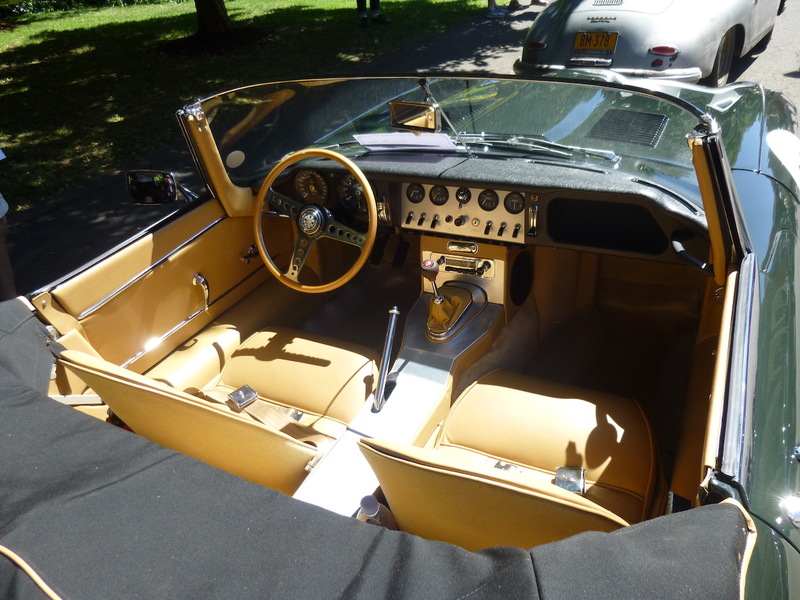 This being a ’65 it has a 2138 cc Triumph TR4 engine. 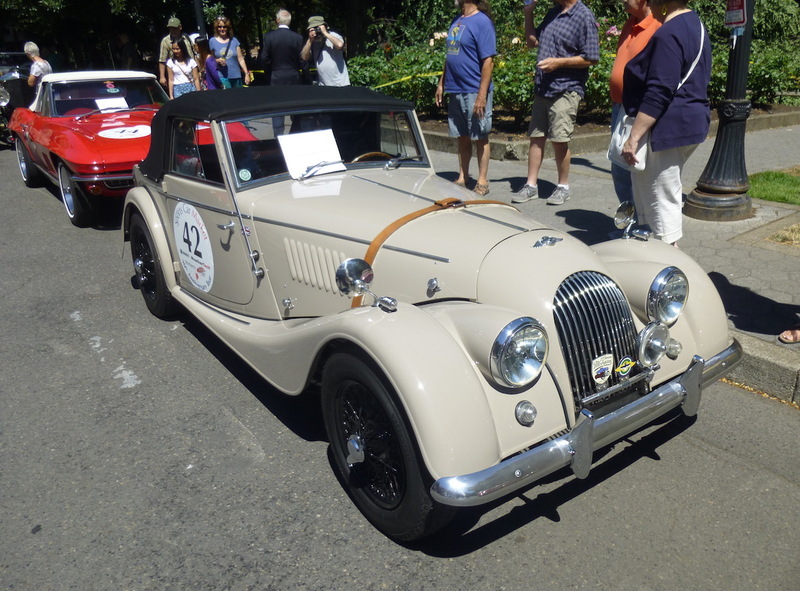 The Morgan Plus 4 cuts a nice profile, don’t you think? 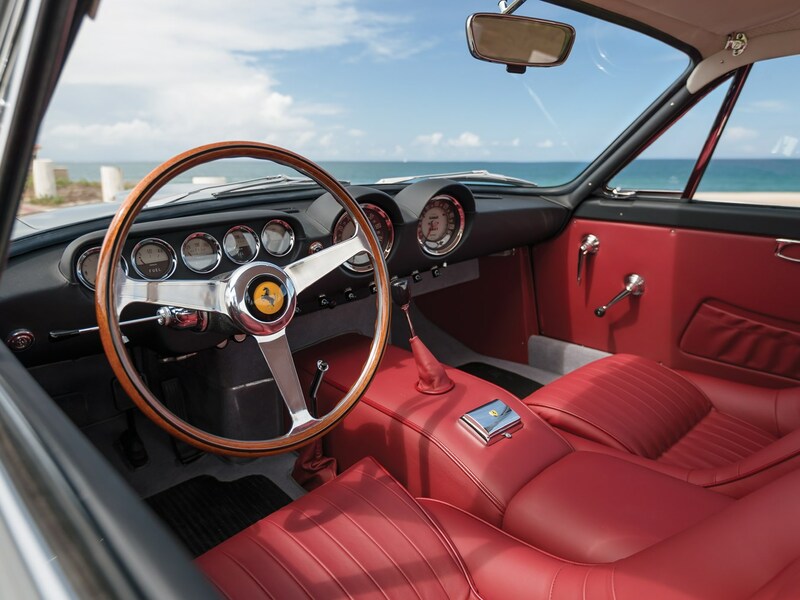 This 1963 Ferrari 250 GT Lusso is considered one of the most desirable Ferraris of the mid 1960s. 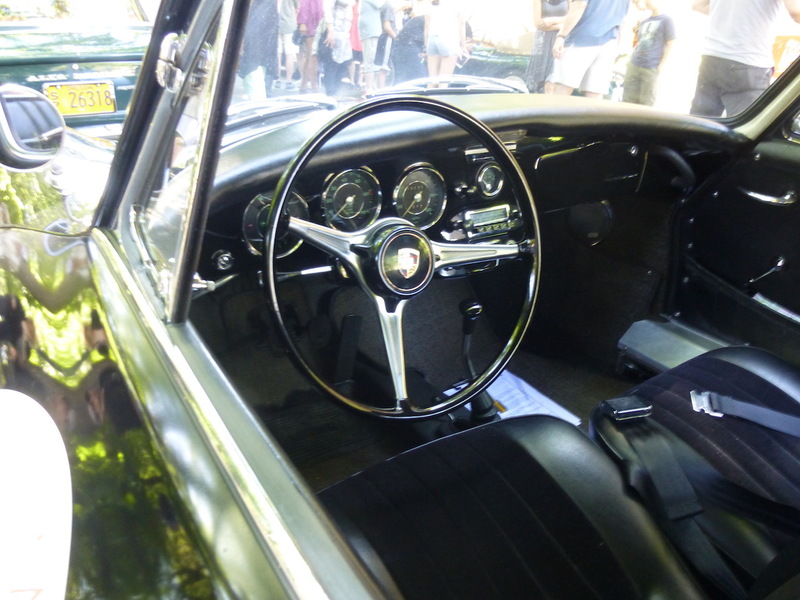 It was only in production for 18 months, and was the last model of the line of Ferrari 250s going back to 1952. Designed by Pininfarina, and bodied by Carrozzeria Scaglietti. The engine is mounted further forward than typical Ferraris, giving more room to the interior. What can I say about the classic beauty of this car? 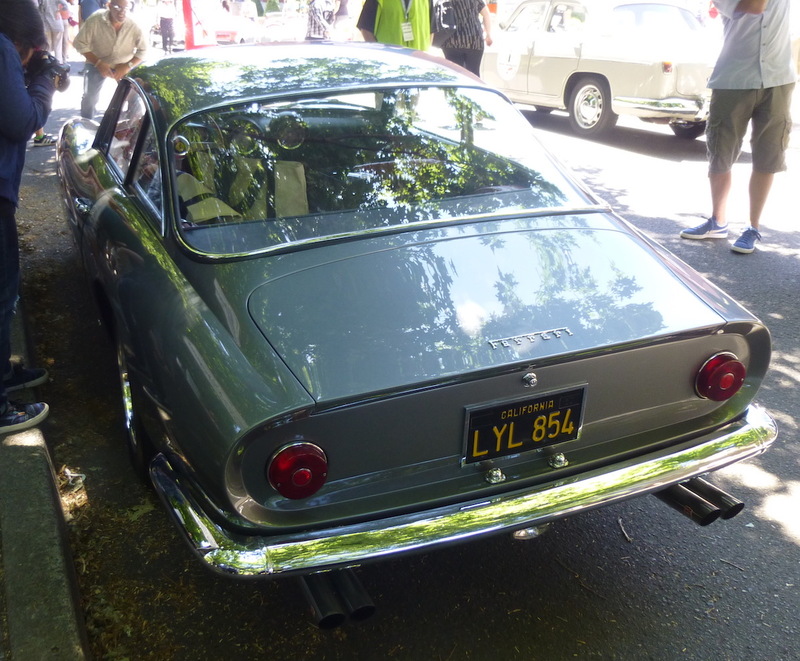 Must look at another 250 GT Lusso’s engine, since this hood wasn’t open. That’s the “Columbo” 2953 cc V12, which could develop 240 hp at 7,500 rpm and propel the 250 GT Lusso to 150 mph. Couldn’t get a good photo of its unusual dashboard, so here’s yet another car. 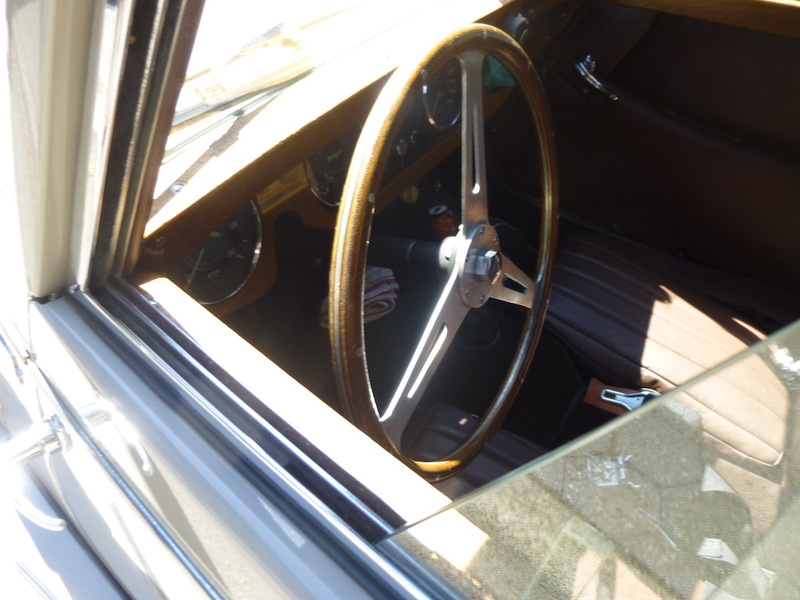 Centrally-mounted tach and speedometer were quite unusual for the 1960s. That’s only a 4-speed transmission. 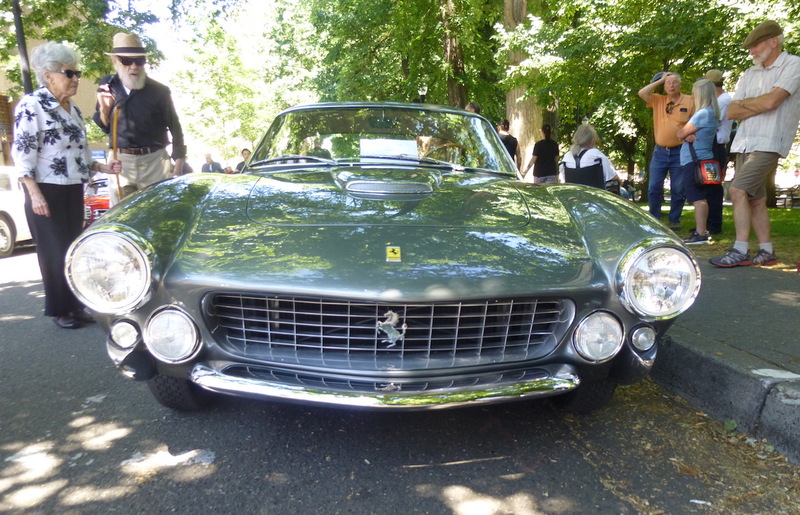 “Lusso” means luxury in Italian. Certainly this cabin is a luxurious place to spend the day on a grand tour. Clean and elegant shapes, with open vision all around. 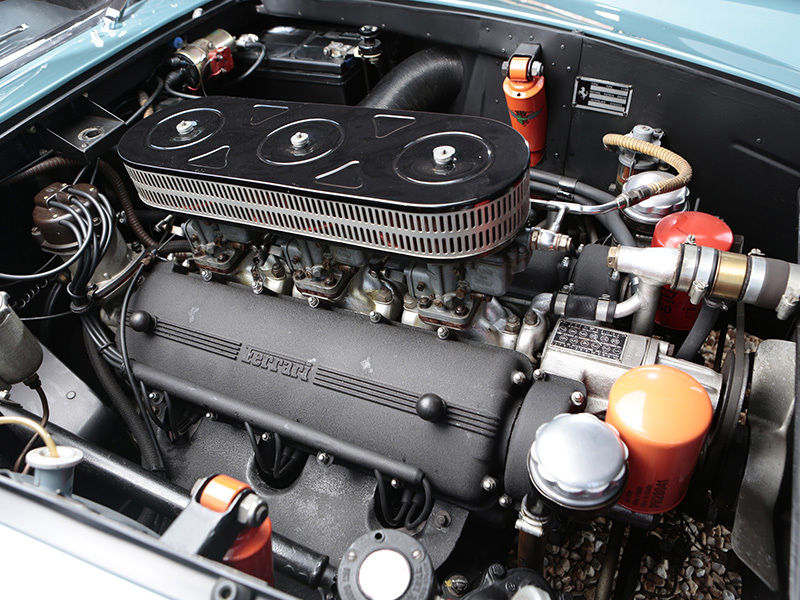 Under that endless bonnet lies a 3.8 liter dual overhead camshaft inline six, with three SU carburetors. 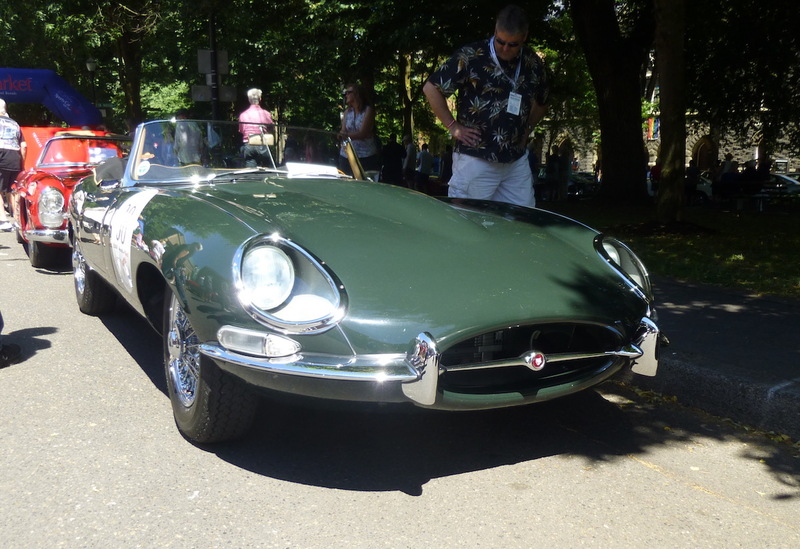 Its 265 hp and 240 lb-ft of torque propels the E-Type roadster’s 2770 pounds to 60 mph in 6.4 seconds and a top speed of 150 mph. 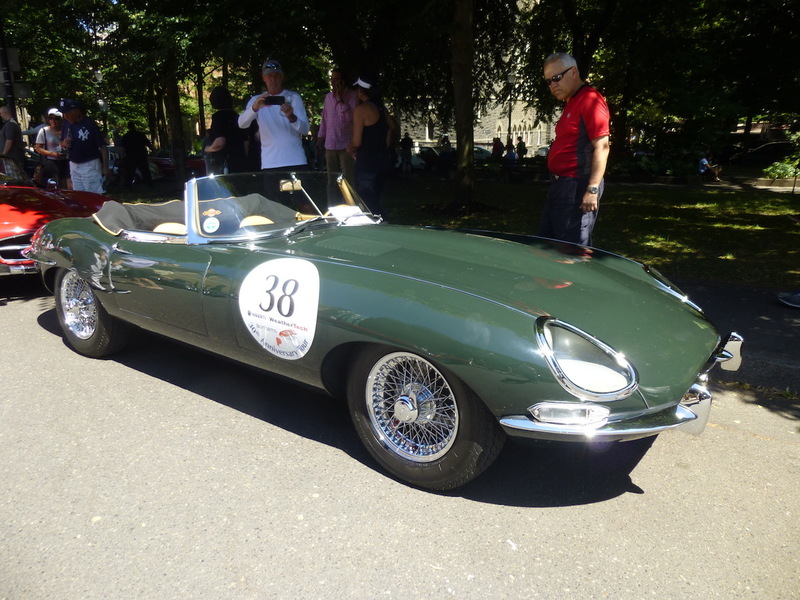 Based on the Le Mans winning D-Type racing car, the E-Type’s unitized construction, fully independent suspension and four-wheel disc brakes set the standard for sports cars going forward. 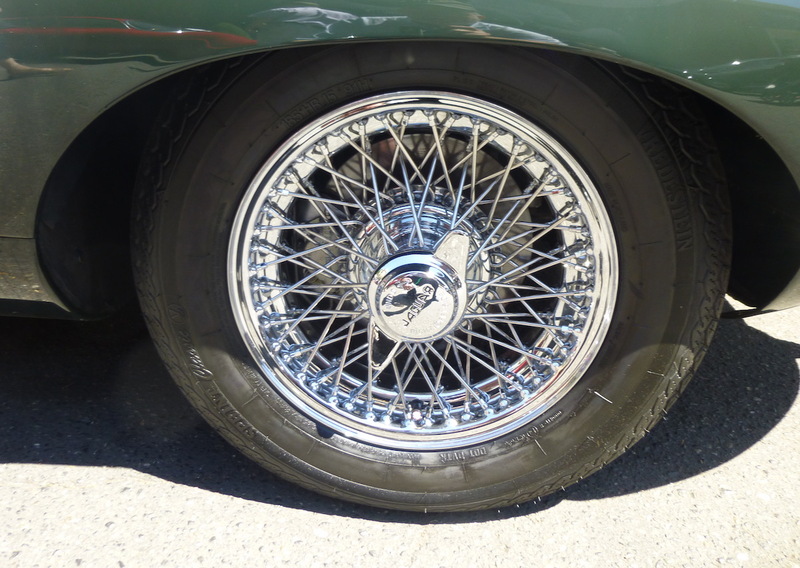 Wire wheels amaze me. It must have been a real art to get all those spokes to the proper tension for a wheel that stays true in cornering and at triple digit speeds. To this day, I don’t think any car outshines the original Jaguar XK-E.
Here’s a pair of 1957 Mercedes-Benz 300 SL roadsters. 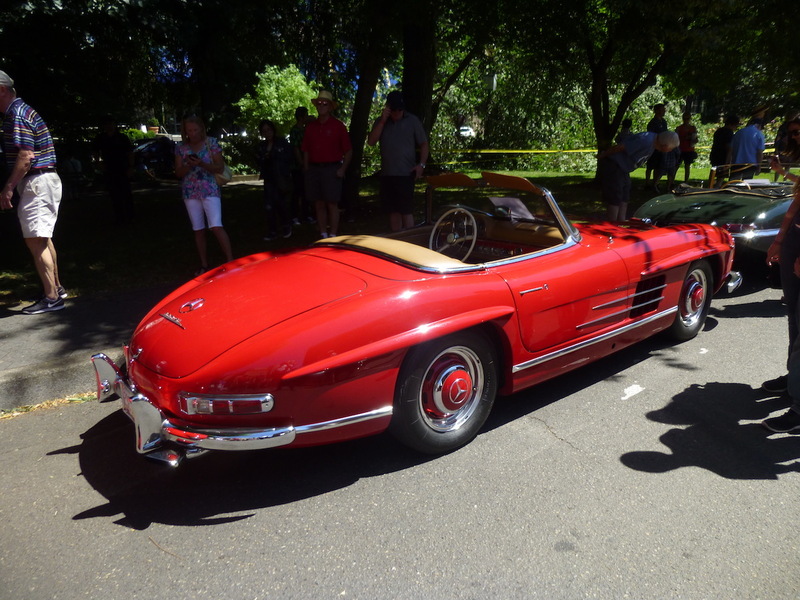 The 300 SL series started with the famous coupe in 1954, and roadsters followed in 1957. 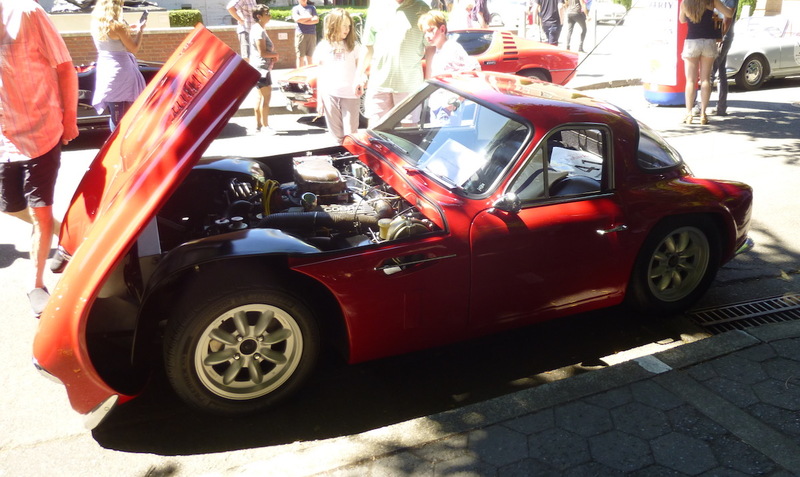 Its 3.0 liter overhead cam inline six was the first production sports car engine with direct fuel injection. 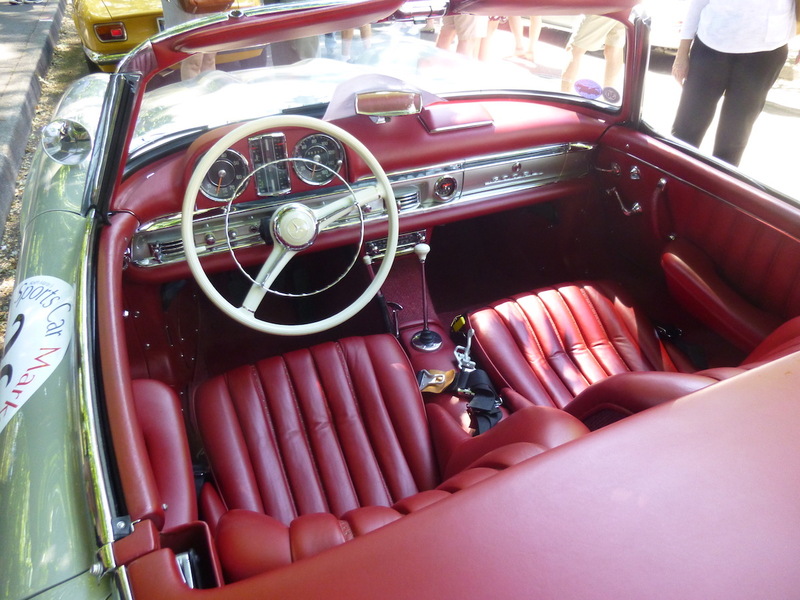 Delightful red and leather interior. That upholstery is so inviting. Note how high and wide the door sills are. There’s a tubular spaceframe inside. 150 mph top speed, 0 to 60 in 7.1 seconds. More than 80% of 300 SLs were sold in the US, adding performance excitement to the solid, sensible luxury image of Mercedes-Benz sedans. 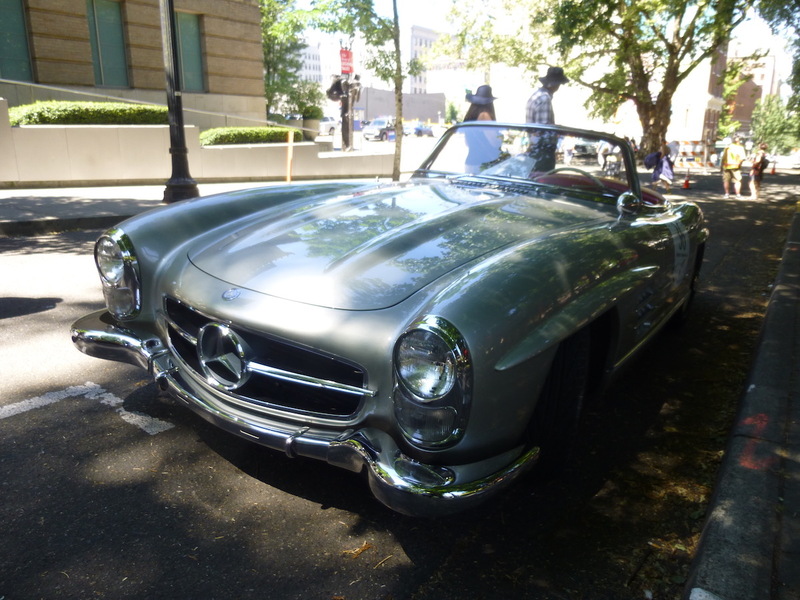 Here’s a 1957 300 SL roadster in silver. Silver with red leather I find equally appealing. Why can’t all those silver cars running around today look like this inside? It has four-wheel independent suspension, but there are swing axles under this trunk, which could be trouble. 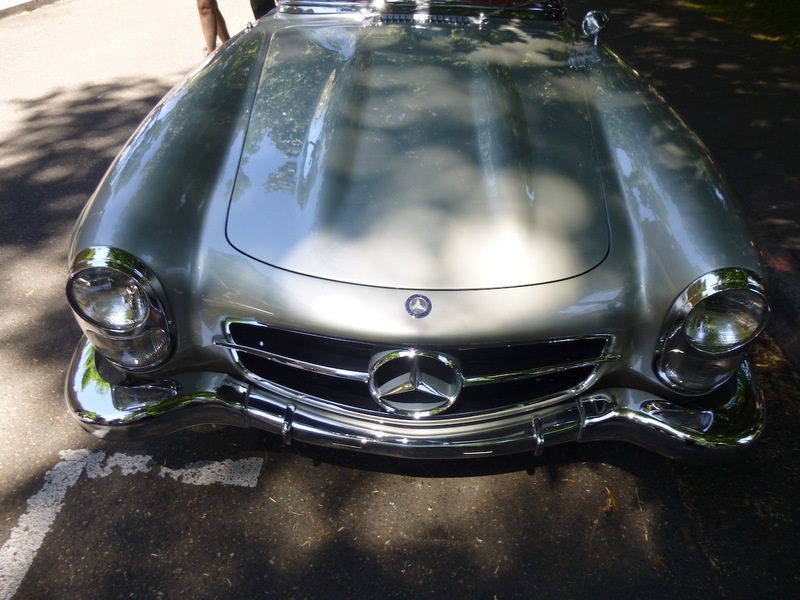 Is the 300SL the first Mercedes with its three-pointed star in the grille? 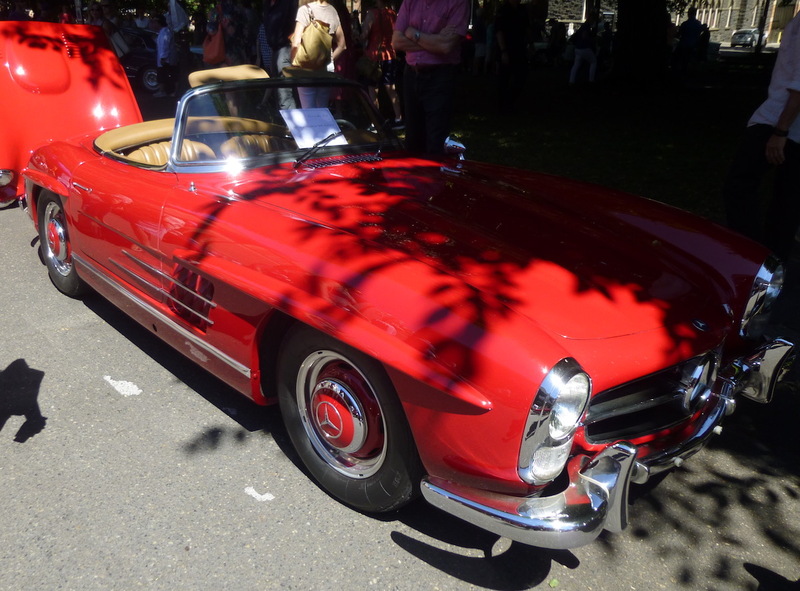 Finally, the famous Gull-Wing Mercedes 300SL. Often imitated, never equaled. 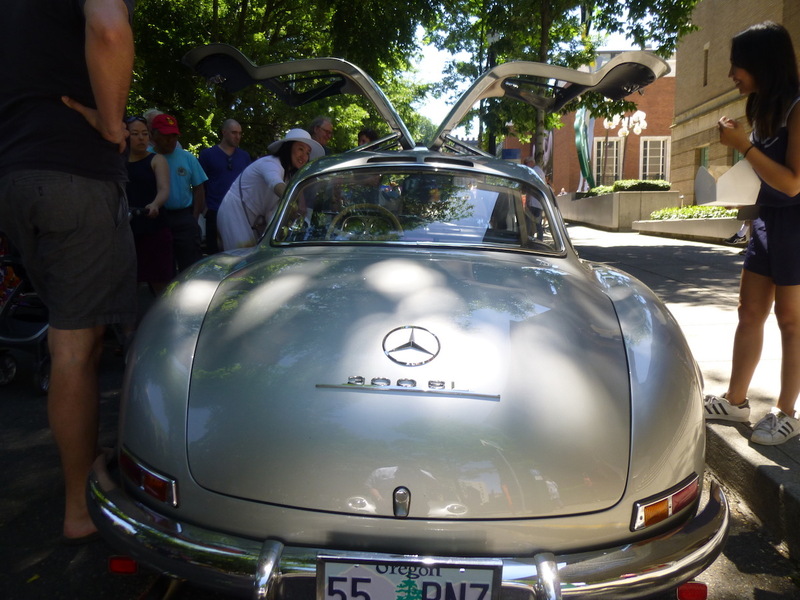 This is a 1955 300SL about to take flight. 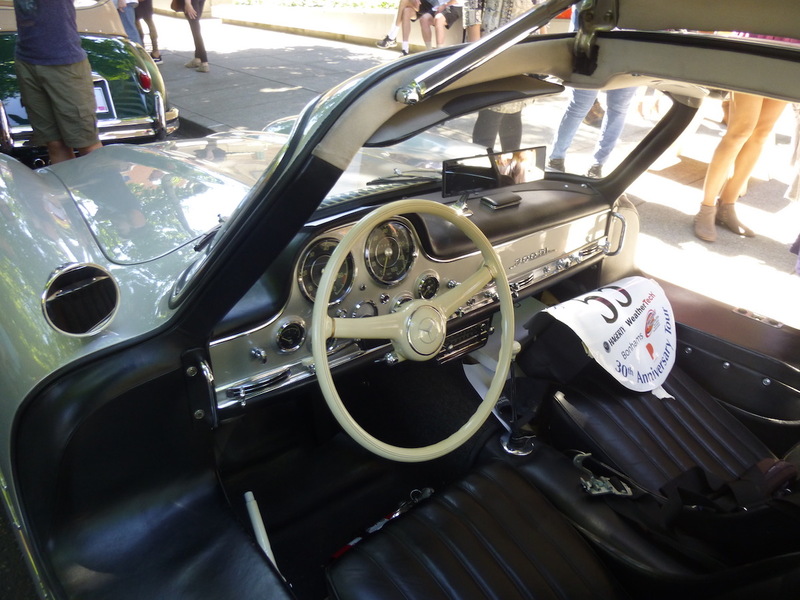 As in the roadster, its welded aluminum tube spaceframe chassis surrounds the passenger compartment, necessitating the gull-wing doors and their high, thick sills. 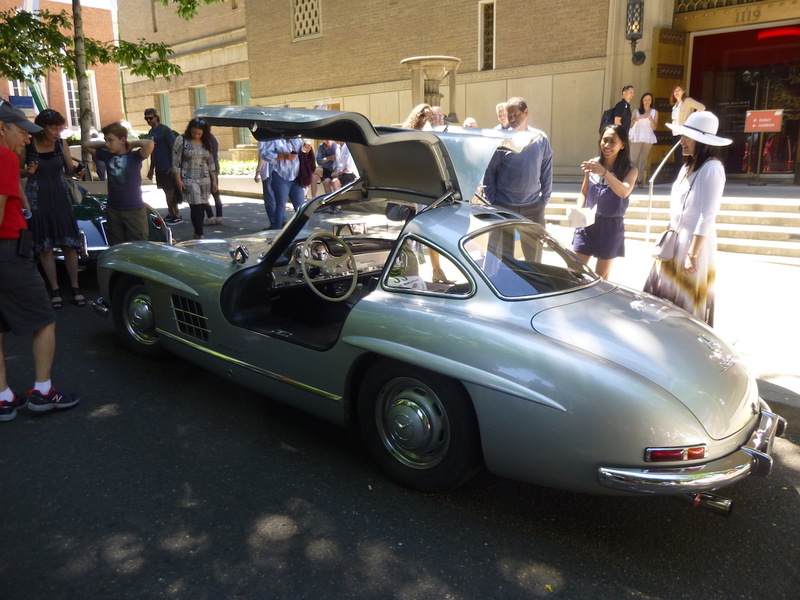 Perhaps the iconic ultimate of postwar sports cars, the gull-wing Mercedes is parked right in front of the museum, with its fabulous exhibit of prewar streamliners. 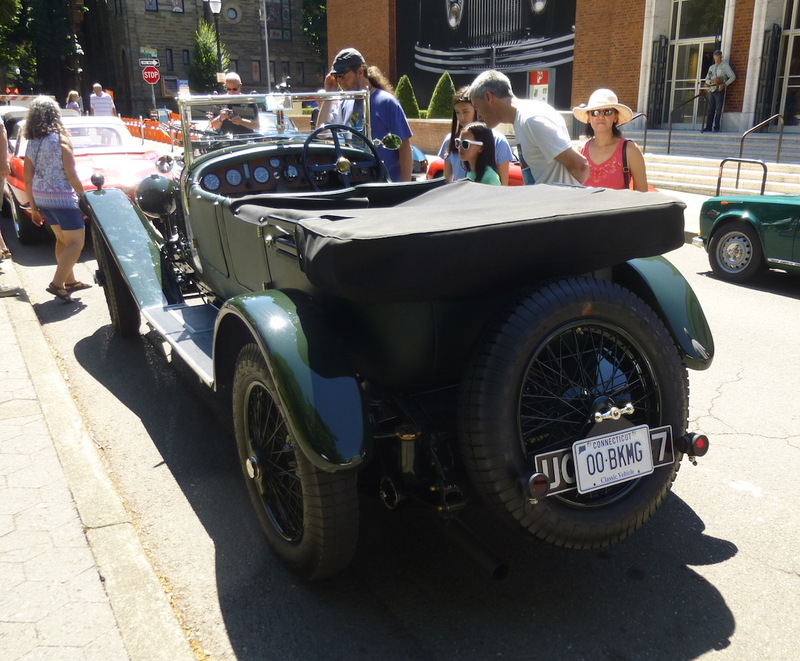 Thanks to all the owners for bringing these historic cars to the curbside. 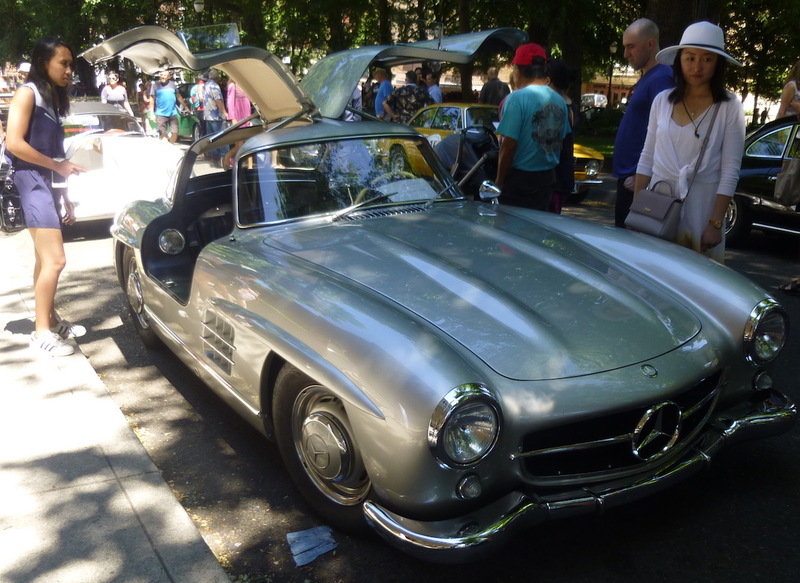 “the famous Gull-Wing Mercedes 300SL. 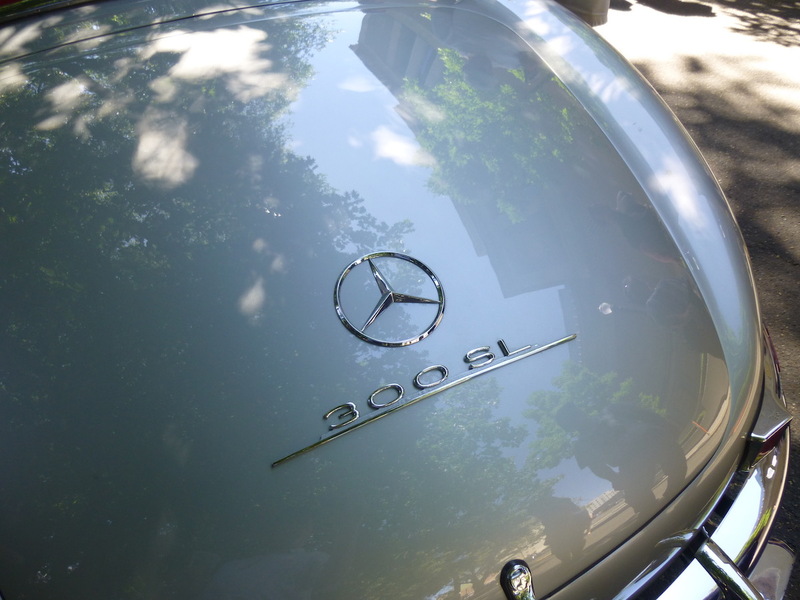 Often imitated, never equaled.”… even by Mercedes itself! 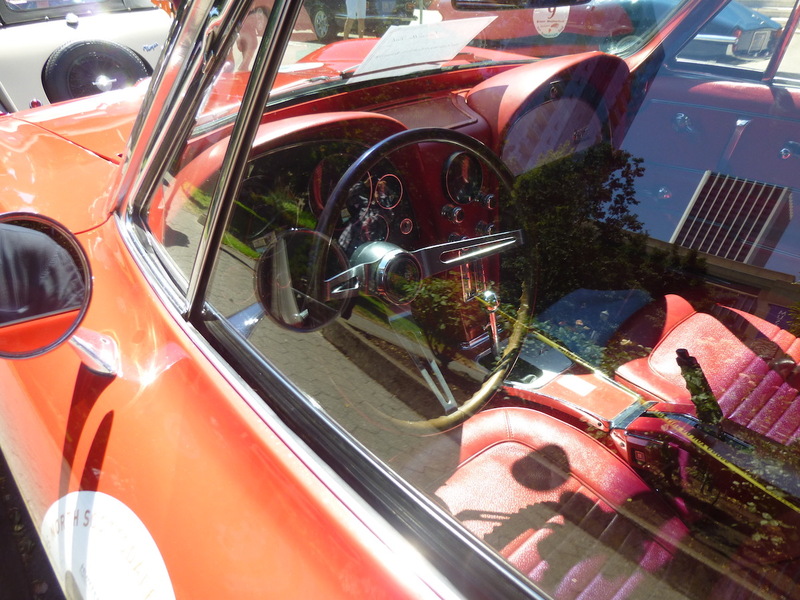 Appears to be a Muncie 4 speed shifter on the red Corvette. Here’s the Muncie shifter image I tried to link. I’ll take the gullwing please. Awesome design. 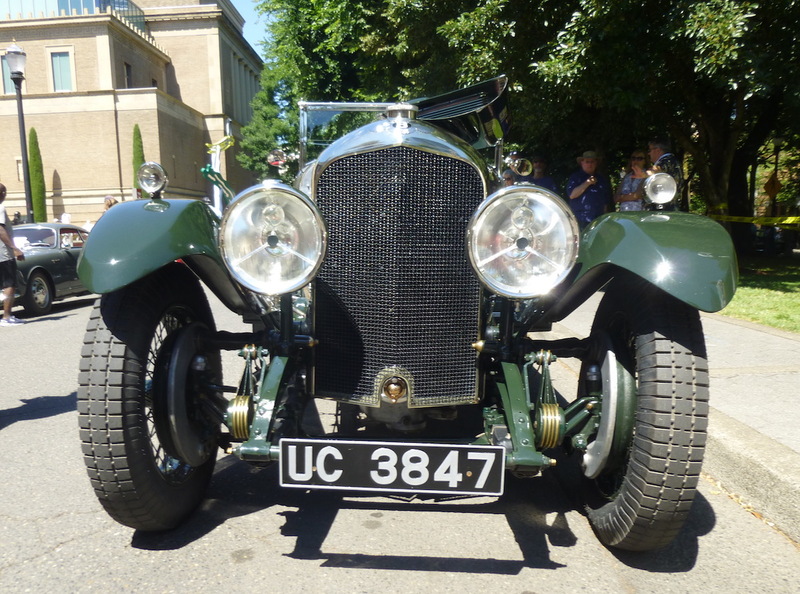 John Steed was in good company with his Bentley ownership; James Bond drove one in his younger days too, I believe. Yep, 4 1/2 with Amherst Villiers supercharger. That would be the famous Blower Bentley. As Bugatti famously said; ‘ the fastest lorries in Europe’. Great selection Mike. That TVR is not a common visitor to CC, nor on my home streets. 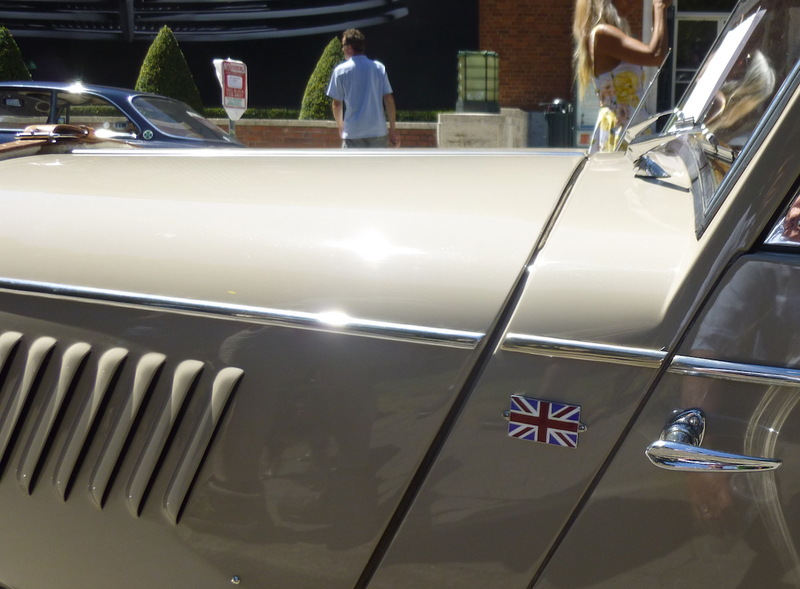 The Speedster would win out, if only for that super clean A face, but then you had to go and show picture of a Lusso. Drooooool. 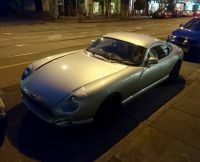 I shot a TVR a while back, and got real close to writing it up, but other priorities got in the way. I used to see one or two in the mid-late 60s in Baltimore. Certainly not a common sight in their day even. These remind me of my London days in the late ’90s. You would see a these around Regent St / Hyde Park / Kensington and other posh places. And the City, though I didn’t go there much. Great place for CCs back then. Wow, what a fabulous collection of fine classics. Thank you for sharing with us! As for “Why can’t all those silver cars running around today look like this inside?”, I’ll second, third & fourth that sentiment! Quite the all-start line-up here. Every one is a gem. A genuine Speedster Carrera; what a rarity. 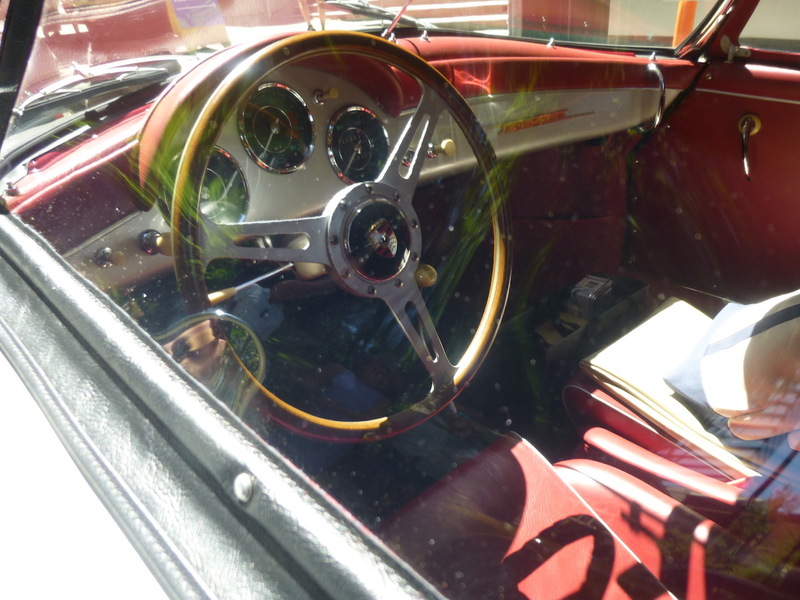 The Carrera was a very expensive option, and the Speedster was intended to be a low-end Porsche. Makes a nice combo. I’d love to hear that Bentley 4 1/2 at full 4,000rpm chat. Thanks for these superb Sunday write-ups. A real treat. Looking at the pictures, I feel like I’ve eaten a very rich chocolate cake, and enjoyed every last crumb. These beauties really stand out on this site where we talk about brown diesels and stuff like that. 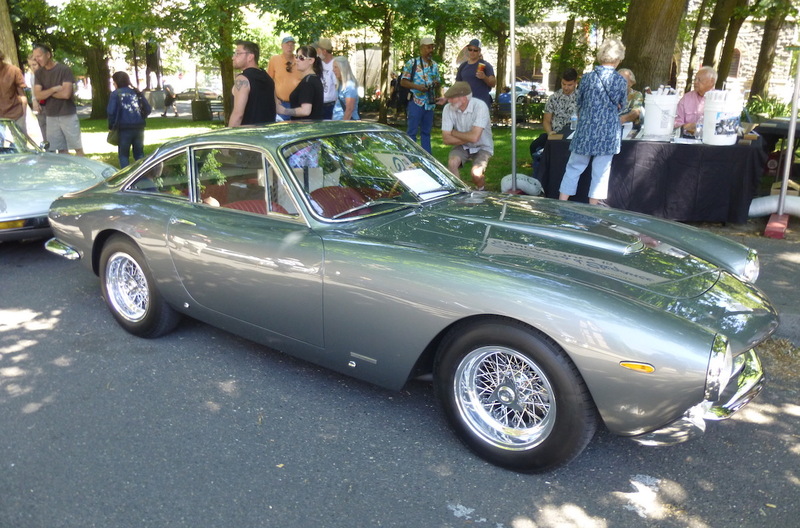 The 250 GT Lusso is maybe my favorite car of all. There’s just nothing that’s not beautiful about it. That front end… And the best color combo for Italians of this era is grey over red – not least on this one. 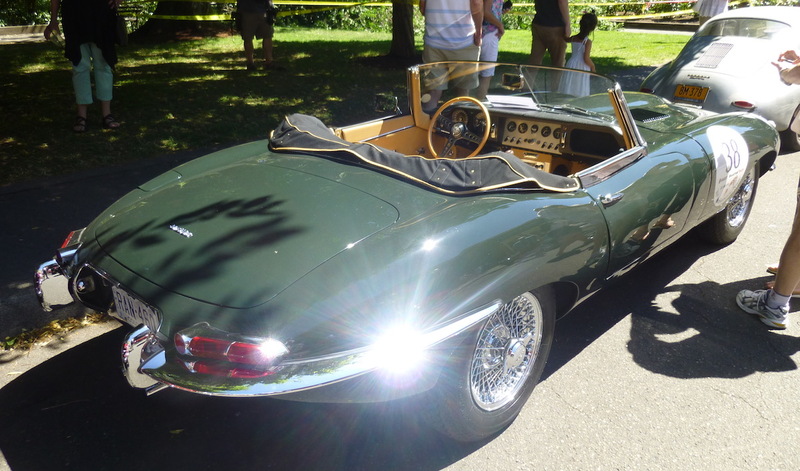 The E type I still don’t get. It’s awe-inspiring both because of its history and the way it looks. But to me it looks too long and the track is too narrow relative to the width of the body. I don’t get the urge to drive it when looking at it, and that means that to me it fails as a sports car. Another fine group. 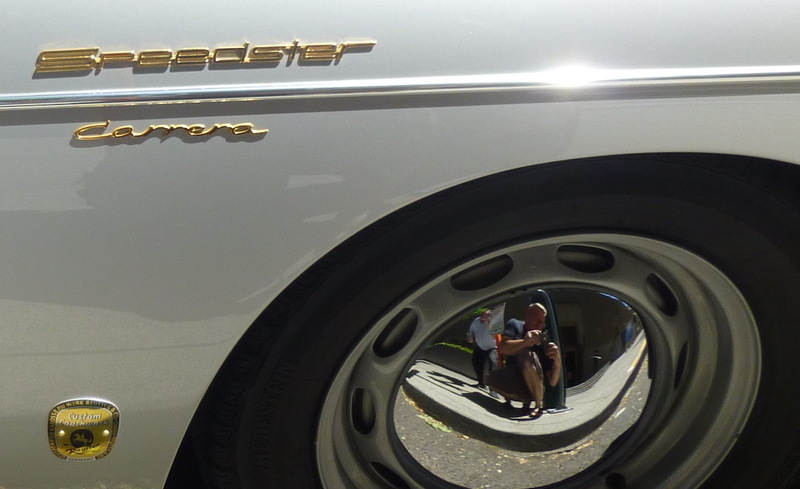 I am with you on old silver cars with red leather – that would entice me into a silver car very quickly. 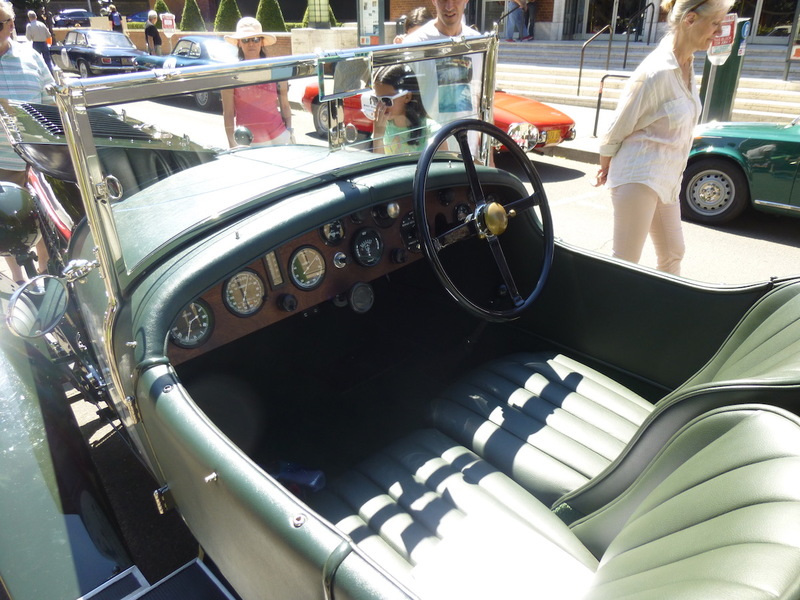 That Bentley is interesting, and its technical specs are sort of a half-scale Duesenberg Model J. Out of all those cars, give me the Corvette – it’s that only car I would desire to own. As far as I am concerned, all the others except for the Mercedes are junk – including Porsche. I sometimes amaze myself with my affinity for the outmoded, the cantankerous, the finicky and the obscure, but of any of these beautiful and iconic classics, the Morgan Plus 4 would be my choice, hands down. I’ve had a Morgan obsession since I bought my first MG at the age of 20. I’ll likely never indulge my craving for one, but it’s still a dream car. So simple, so antiquated, with such rudimentary classic driving characteristics. I’d nearly give my left arm for one.